Product information "Haibike SDURO Hardnine 6.0 black/titan/bronze men 2019"
The Bosch Performance CX has been optimized for sports performance. The engine supplies a constant maximum torque of up to 75 Nm up to a high speed range. In addition, it has the "Direct Flow" technique, which guarantees a powerful support in the lower cadences from 20 rpm. The Trail Control offers a dynamic power control, in which the driver can always choose the right support level (from 50-300%) and thus set the perfect balance for off-road. The gear change control allows chain-saving gear changes. The new compact display is a combination of remote control and display. Positioned on the left side of the handlebar, it provides the most important information via a small, easy-to-read display. Its compactness and position make it ideal for more extreme ePerformance bikes, where riders want a down-to-earth, yet well-protected display. Directly at the Purion also the controlling of the most important functions takes place, like the choice of the support levels (Off, Eco, Tour, eMTB / Sport, Turbo) or the switching on and off of the light. Likewise, a pushing aid can be activated, which drives the eBike up to 6 km / h.
The Purion displays the current speed, the day trip and the total kilometers of the eBike. The remaining range display shows how high the remaining range is. Illumination in the display ensures good readability in all lighting conditions. 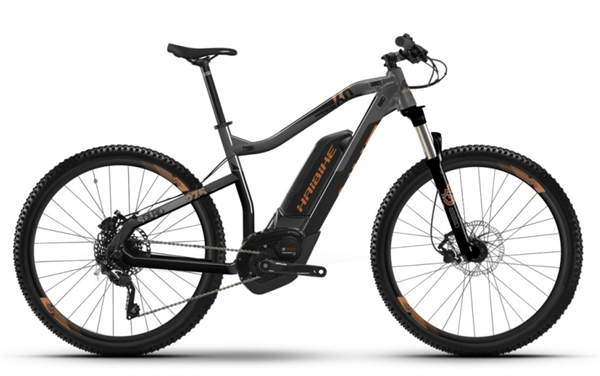 Related links to "Haibike SDURO Hardnine 6.0 black/titan/bronze men 2019"
Customer evaluation for "Haibike SDURO Hardnine 6.0 black/titan/bronze men 2019"